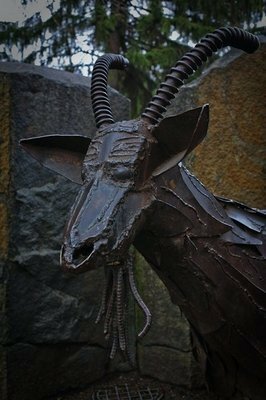 Surrounded by a grotto of basalt columns is one of the most perennially popular remnants of Riverfront Park's past - the "Garbage Goat." Sculpted by Sister Paula Turnbull, a local nun and leading figure in Inland Northwest arts, this statue seems like an unlikely source of controversy. 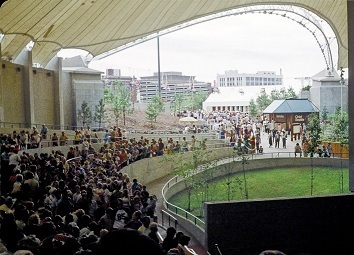 Yet, it became part of one of the oddest and longest-lasting debates during Expo '74. 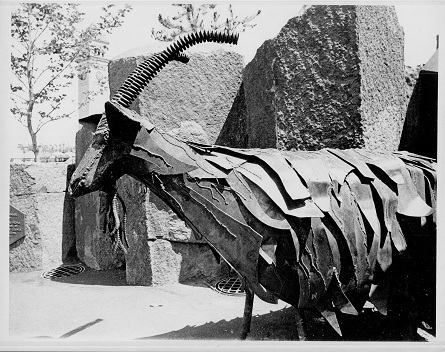 Highlighting the hidden tensions of the fair's themes and exposing the attitudes of Spokanites and fair visitors alike, this steel goat became a cipher for understanding the world's fair. 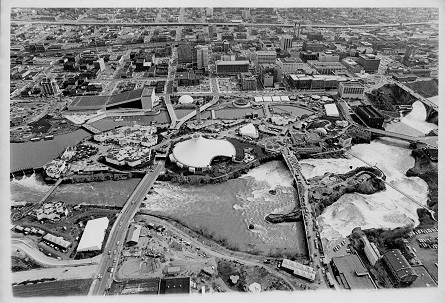 It all began as an effort to keep the new riverfront environment fresh and free of paper and other waste during the busy fair months. The Spokane Women's Council of Realtors sponsored a unique trash collector - a goat sculpture. 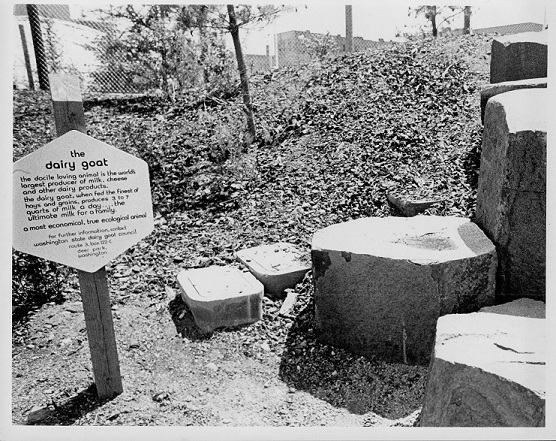 Installed at the end of April 1974, it was unlike both typical sculptures and typical trashcans. A recorded voice asked for garbage when visitors approached. Then, at the press of a button, a powerful suction device pulled refuse into the goat's mouth. Even before it was added to the fair site, dairy goat farmers protested showing goats as living trash compactors. Kent Leach, editor of The Dairy Goat Journal, called the vacuum system disguised as a goat a "degrading, debasing, and grossly misleading" addition to the fair. Dairy goats, another letter-writer argued, were "most fastidious in their eating habits." 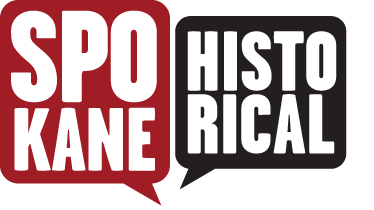 Writing to The Spokane Chronicle, John R. Hollister of Deer Park said that the public needed to be educated "to the fact that a goat should be properly fed like any other creature." At fairs, their prize-winning goats were sickened by "all manner of trash" fed to them by young and old alike. Despite these pleas from goat farmers and goat lovers, the statue motivated more than a few defenders. On June 27th, 1974, The Spokane Chronicle's column "The EXPOsitor" challenged readers "to find a scrap of loose paper, tin or glass within 50 children's feet of the grotto." Ardent "garbage goat" defender, A.A. Sellen claimed that "joy reigned supreme in the happiest and cleanest corner on Expo grounds" when the goat was in operation. Temporarily turned off, however, the goat "lost his winsome voice" and "children and oldsters turn away sadly and soon desert this corner of gloom." In this and other controversies, fair decisions were both praised and condemned in environmental terms. So, the Expo '74 organizers compromised with the goat farmers and added signage on real dairy goats. With the zeal of ad copy, a new plaque described how on the "finest of hays and grains," a goat could produce "3 to 7 quarts" of "the ultimate milk for a family." 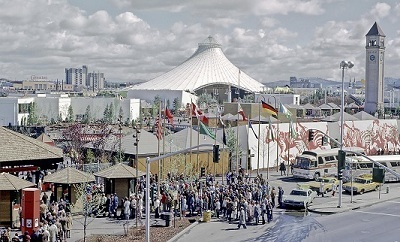 Reflecting the ironically combined environmental and entrepreneurial spirit of Expo '74, it described the goat as "a most economical, true ecological animal." The fair organizers remained interested in "Celebrating a Fresh, New Environment," with an emphasis on "celebrate" even when the environmental choice was unclear. And even when it got a few goats. Clayton Hanson, “Getting a Goat,” Spokane Historical, accessed April 24, 2019, https://spokanehistorical.org/items/show/78.